The new LE250 from Banner Engineering is optimized for measurements ranging from 100 mm to 400 mm, the LE250 features superior measurement precision and a small laser spot size. The sensor's linear array allows for reliable detection and measurement across a wide range of difficult targets, from black rubber to shiny metal. 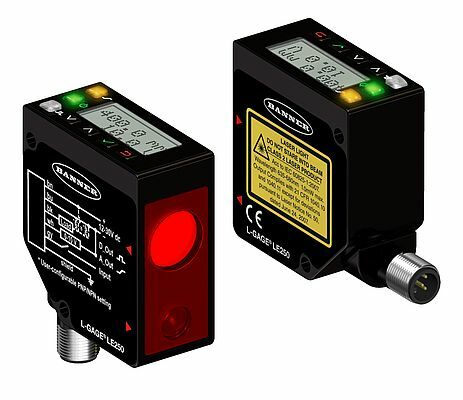 With a resolution of 0.02 mm out to 250 mm and a resolution below 0.2 mm out to 400 mm, the LE250 provides the repeatability and accuracy for solving applications where precise dimensional measurements or positioning are needed. The sensor also features a smaller spot size, approximately one millimeter, which is good for small part detection, and provides more consistent measurements for applications that present varying colors, including multicolored packaging. The sensor operates with an intuitive two-line, eight-character display, allowing for easy readability, quick adjustments and simple menu navigation. The visible red, Class 2 laser beam and small spot size ensure quick setup and alignment. Features like delay timers and averaging trigger functions can reduce PLC programming time and help get an inspection up and running sooner. The product is also available with an optional metal, rotatable connector and multiple mounting bracket options, allowing operators to save time and money while accommodating flexible application requirements. Enclosed in a rugged, die-cast zinc housing and IP67-rated polycarbonate lens cover, the sensor ensures optimal performance in demanding environments. All models meet Military Standard 202 G requirements method 201A, in addition to IEC 60947-5-2, to withstand applications subject to vibration or shock. Banner Engineering is a global leader in the manufacturing of photoelectric sensors, indicator lights, vision sensors and vision lighting, machine safety systems, and wireless sensor networks. Safety light curtain, two-hand-control, safety controller, safety scanner, Illuminated E-Stop etc. Banner Engineering Corp. introduces its new 2011 product catalogue, which showcases products from all divisions, including sensors, vision sensors and lighting, wireless, indicators, and machine safety.